The pyrenean shepherd-male "CH. Degas de la Vallée du Mouton" (own. 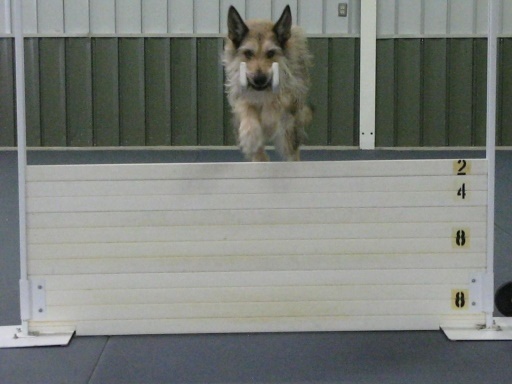 Dr. Angela Rösner) competed at the competition at Rendevous-Berg on May 1st in Agility A2 with excellent and 0 faults ! The pyrenean shepherd-male smooth face "Obscure Bleu de la Vallée du Mouton" (own. Sieglinde Bayer) won the title "Alpencup-Winner" 2013! Obedience:On Dec 9 2012 the smooth face pyrenean shepherd-female "Grivette de la Vallée du Mouton, called Zuri" (owner Dr. Monique Bolliger) won first place at the Obedince Beginners class at Sirnach with 275 points ! On Nov 4 2012 the smooth face pyrenean shepherd-female "Grivette de la Vallée du Mouton, called Zuri" (owner Dr. Monique Bolliger) won second place at the Obedince Beginners class at Bäderstadt with 272,5 points ! On Nov 3 2012 the smooth face pyrenean shepherd-female "CH. Foca de la Vallée du Mouton" (owner Annuka Lehikoinen) won first place at the Obedince Open class at Kotka ! 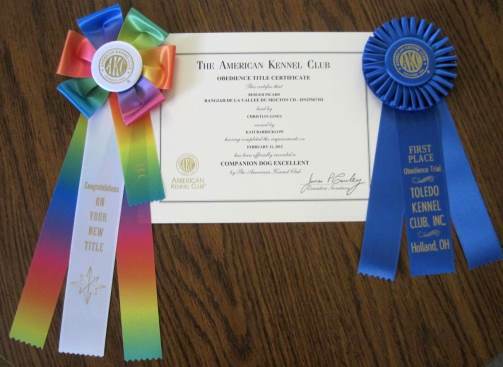 On Feb 11 2012 "Flicka (Rangiah de la Vallée du Mouton)" (owner Kati Barricklow) won first place at an Obedience A competition in Toledo, OH and received her third qualifying score in Open Class. She is now the first Berger Picard in the USA to receive title “CDX”. Rangiah de la Vallée du Mouton "Flicka"
On Nov 5 2011 the smooth face pyrenean shepherd-female "Foca de la Vallée du Mouton" (owner Annuka Lehikoinen) won first place with 190 out of 200 points at the Obedince Beginners class at Kotka ! Berger Picard “Rangiah de la Vallee du Mouton, CD” (called “Flicka”) – owner Kati Barricklow – competed on February 13 in her first AKC Open Class Obedience Competition and won 1. place out of 12 dogs. Flicka got 195 out of 200 possible points and won over breeds like Golden Retrievers, Tervueren, Australian Shepherds, Standard Poodles, Shelties and others ! Berger Picard “Rangiah de la Vallee du Mouton, CD” (called “Flicka”) – owner Kati Barricklow – competed on March 19 in an AKC Open Class Competition and won 2. place. Flicka got 193,5 out of 200 possible points ! Berger Picard “Morphee de la Vallee du Mouton” (called Spice) won the following AKC agilty titles: Novice Standard (NA), Novice Jumpers (NJ) and Open Standard (OA). Morphee is the only Picard with AKC agility titles ! 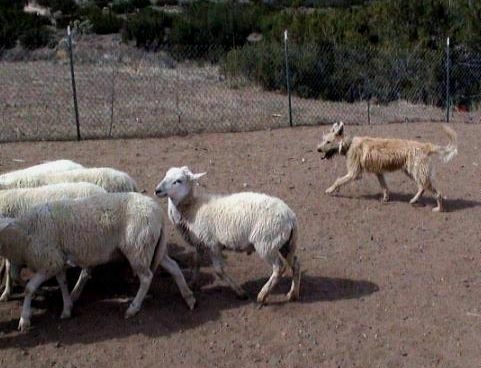 The Berger Picard-male "Zhacques de la Vallée du Mouton" (Owner Leanne Chease) passed at april 9th and 10th in Valley Center, Kansas succesfull the AKC Herding-Instinct test ab ! Breitensport: The pyrenean shepherd-male "Allegro de la Vallée du Mouton" (Owner Gaby Junker) has won 6 competitions from 7 (in 2006) and was Vice-Champion of Austria ! 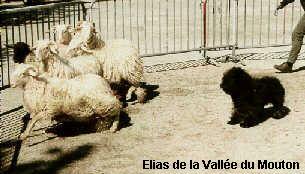 At the french clubshow is every year a test for young dogs with the sheeps, it's called CANT". 1997 The pyrenean shepherd-male "Navaillo de la Vallée du Mouton" (owner Rahel Steccanella) has done the best CANT 1997. 1998 were tested more than 30 dogs, only 3 dogs have been accepted, best CANT has done the pyrenean shepherd-male Ya Bon de la Vallée du Mouton" (owner Peter Saller), at the third place was his sister, Ytcha de la Vallée du Mouton" (owner Catarina Carlsson) ! Father of Ya Bon and Ytcha is Navaillo de la Vallée du Mouton" who was winning one year before ! In the year 1999 our face-rase female Nectarine de la Vie Pastorale" has done the best CANT from all dogs at the french national show. One year later two pyrenean shepherds from our kennel were entered to the CANT, both accepted with very good results: the fawn female Garance de la Vallée du Mouton" (owner Mr. Zürcher from Switzerland) and the black male "Elias de la Vallée du Mouton" (owner Mme Duprey de la Maherie from France). 2003: our face-rase female Tourettes de la Commanderie au Gonfanon Bauceant " has done the CANT with best result. 2003: our Picard-male "Toy du Val de Thelle" has done the CANT at the show in Avignon with a very good result. The Picardy-female "Xelie de la Vallée du Mouton", Owner Bob & Michele McDegus (USA), is now HCT (Herding Capability Test) and JHD (Junior Herding Dog) ! End of July the Picard-female "Xelie de la Vallée du Mouton" was entered in her first Border Collie Sheepherding Trial an took First Place ! 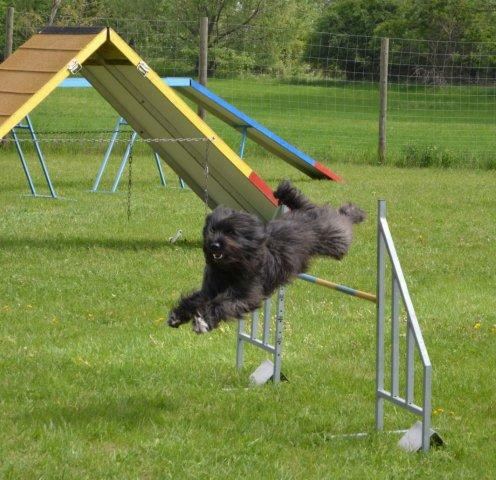 The pyrenean shepherd male "Nounours de la Vallée du Mouton" has done the Agility A1-examination. 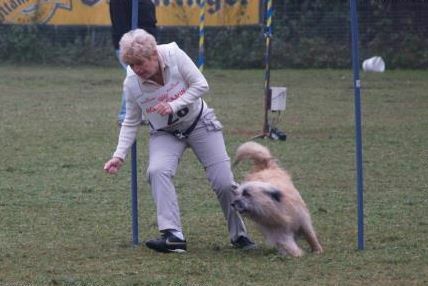 The fawn female Xaquette de la Vallée du Mouton" (owner Mrs. Jusinger) was 1999 Austrian Champion in Agility Mini A3 ! 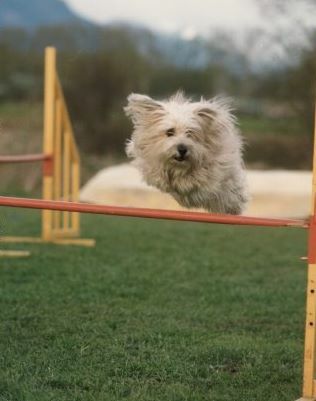 The pyrenean shepherd female "Urroye de la Vallée du Mouton" has done 1999 the Agility A1-examination. 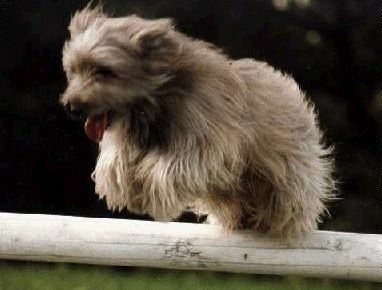 The pyrenean shepherd male "Bellocq de la Vallée du Mouton" (owner Mrs. Reiter) was 2000 Agility A1 styrian cup-winner ! 2001 he was in the medium-class third at the ÖGV-Cup ! The pyrenean shepherd female "CH. 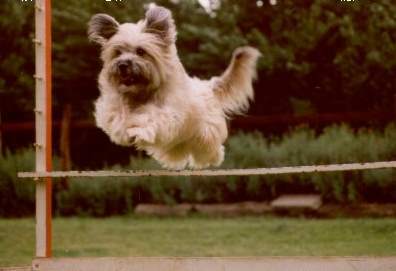 Ivorine de la Vallée du Mouton" (owner Gaby Grohovaz) was 2001 the "best agility mini dog", "best non contact agility mini dog" and "best jumping dog" from all breeds in south africa. Ivorine get 2002 south africain Championship winner in Dog jumping and got the title"Dog Jumping Champion". 2002, 2004 and 2005 she was South Africain Agility Champion in medium class and 2003 Vice-Champion. The pyrenean shepherd female Urroye de la Vallée du Mouton" (trainer Mrs. Glaser) has made an examination as therapy-dog. The picardy shepherd female "Za Saima de la Vallée du Mouton", (owner Mrs. Glaser), has made the examination as therapy dog. The pyrenean shepherd female "CH. Ivorine de la Vallée du Mouton" (owner Gaby Grohovaz) won 2005 the south africain "Dancing-dog" Championship. The pyrenean shepherd female Ourse Zoe de la Vallée du Mouton" (owner and trainer Mrs. Anette Bang Pallesen, DK) has done the obedience class LP 1 on may 19th 2001 in Fredensborg with 99/100 points. She was the best dog in her class and later awarded the best performance of the day" out of all dogs/classes. She also was the youngest of all dogs ! Only two weeks after her first award in Obedience LP1 has Ourse Zoe de la Vallée du Mouton" (owner and trainer Mrs. Anette Bang Pallesen, DK) done the obedience class LP 2 on june 4th with 144/150 points. She was the second best dog in her class and all this succes for a 13 month old dog ! At 21th april 2002 Ourse Zoe de la Vallée du Mouton" (owner and trainer Mrs. Anette Bang Pallesen, DK) won the 1. price in obedience class LP3. It was her first competition in this class and she scored 270 points out of 280 and also became best dog of the day ! At 26th may 2002 Ourse Zoe de la Vallée du Mouton" (owner and trainer Mrs. Anette Bang Pallesen, DK) won the 1. price in obedience class LP3. She scored 274,5 points out of 280 and became against best dog of the day ! "Ourse Zoe de la Vallée du Mouton" won this year three first prices in Obedience-Elite-class in only 4 competitions and is now Danish Obedience-Elite Champion. Congratulations to Anette Bang Pallesen ! 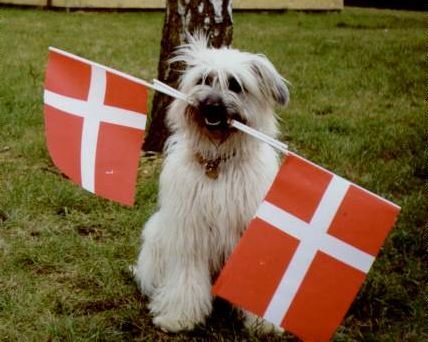 September 2003: "Ourse Zoe de la Vallée du Mouton" is now also Swedish Obedience Champion ! The pyrenean-shepherd-female "CH. Ivorine de la Vallée du Mouton", (owner Gabi Grohovaz, south africa) has done the obedience-class A end of june 2002 as best dog of her class !